Archery hunting is a sport that involves many different skills. The most important of which is putting an arrow through the vitals of your game accurately. This is impossible without a good archery sight. The best bow sight should provide a way of aiming and predicting the arc of your arrows, be rugged enough to stand up to all hunting challenges you face in the field, and be simple and intuitive to use so you don’t fumble with it when the time comes to use it. Few bow sights do all of these things well. Here are the best types of archery sights in each category, and when to use each type. Archery can be as complex as you make it but is generally pretty simple if you follow the right guidelines and get the gear that is best for you. Let’s now take a closer look at the best bow sight’s the market has to offer for each different style. If you need the absolute best archery sight, looking forward to this model from Spot Hogg called the Tommy Hogg. It is a single pin movable sight that offers extreme precision .019” fiber-optic, and a full complement of measurements and movable axis to compensate for a shot. If you need the utmost imprecision this is the best Spot Hogg sight to have. It has a single pin which is easy to focus on an extremely bright day, even in almost no light but is fully adjustable on the fly for when you know the given wind conditions and range of your target. If there’s a downside to the sight, it’s that it is huge and heavy. The robust quality and construction of the sight is an asset but it can be heavy after a long-range session or care through woods. If you are going to be shooting at close range, like in heavy brush wherewhite talesand hogs normally are, this might be overkill but if you’re a serious elk hunter out West that shooting to the edge of their bows extend the range, you might take full advantage of everything the sight has to offer. With the problems of multi pin sights is the fact that your eye wants to jump between pin to pin. Thiscompany called IQ Bow Sightshas created a system called retina lock that trained your eye to focus on each individual pin for greater accuracy while you’re shooting. This is a remarkable improvement over the traditional multi-pin sight. The fiber optics on the cyclo-extremely bright, brighter than any archer sight I’ve ever seen. That is especially useful when hunting during the early season when archery is most common because you can take advantage of the very last minutes of light when trying to bag a Buck sneaking into afood plotat the very edge of legal shooting hours. For a new shooter looking for an effective bow sight, this is a great option. Having multiple pins allows you to predict the arc of your arrow through the brush, as well as being quite a bit simpler than an adjustable sight but having more capability than a single pin. These are a great compromise of features combined with the excellent retina lock technology exclusively from IQ bow sights. Overall the build quality of this sight is phenomenal. There’s nothing to worry about when you buy one of these, they are excellent equipment for the price and perform exceptionally well in the field. Compared to other sights they have similar features in the fact that they have multi-pins, good elevation inwindage adjustments, and are available in 3, 5, and 7 pins. They are exceptional sights that you can’t go wrong with using. A movable pin sight is a sight that uses a pin set on a track that is adjustable for windage and elevation. This makes it possible for you to use the sight from very close, to very far shots and not have to use a holdover or guess at where your arrow is going to go. Looking to the best way to employ a sight like this is where you’ll find out very quickly whether or not it’s a quality sight. The majority of hunters using this sight are going to be using it in a situation where they’ll need to go from shooting very close to very, very quickly. This is a great option because it has everything squared away from the mounting, to the adjustment knobs and the huge range of elevation you can select from. Trophy Ridge makes an excellent quality sight, combining the proper designs that make the most of this sight’s .19” diameter fiber optic cables while making the sight lightweight and compact enough to not sacrifice infield performance to gain the extra movable sight capabilities. The feature that sets it apart is how quickly you can move from a close in shot, to a long-distance shot setting. All things being equal, this sight is extremely fast and the best blend of quality, luxury, and functionality of the current crop of movable pin sights. This pendulum sight from Truglo is the best out there because it combines all the features you need while still being cost-effective and lightweight. If you want the simplest pendulum sight you can get your hands on, this is a great option. It is a single pin sight that let’s you use your sight as a pendulum, or as a fixed single pin. This is great for hunters who will be hunting out of a tree stand but also occasionally hunt on the ground in a ground blind or in a spot and stalk. The option to lock the pendulum in place isn’t available on every model but this low-cost option includes it which is a huge plus. 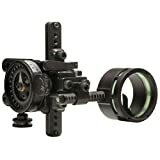 Other amenities like a small .029 fiber-optic, illumination, and dual levels to make sure that your shot is on target make using this sight easy in the field under pressure. The extra-long armored fiber-optic is wrapped around the enclosure of the aperture and blows extremely bright even at the edge of legal shooting light. Overall, it is extremely compact and lightweight but you shouldn’t have any durability problems despite the dainty look of the sight’s body. This sight comes in cheaper than most every other sight but still allows for all the abilities of a pendulum or fixed pin sight, ends adjustable for both left and right-hand shooters. This is an excellent sight if you are looking to try out a pendulum or just getting started in archery and will be hunting mainly from tree stands. Trophy Ridge is the largest manufacturer of bowhunting accessories. They make everything from high-quality bow sights toquiversand slings. This is their best Trophy Ridge branded bow sight that performs well in the field while not being too expensive or overburdening. Trophy Ridge designs many products, many of which are also very expensive and very elaborate. This is not one of those products. This is a very easy to use archery sight that creates an effective way to see the target and focus on individual pins. Most cheaper sights use bulky, hard to focus on fiber optics that are hard to use at range. Trophy Ridge uses an ultrabright and small .19” fiber optic that is wrapped around the housing to collect massive amounts of light and glow in the darkest of conditions. With this sight you get all of the benefits of a multi-pin sight, reliable fixed operation and a way to predict the arc of your arrow while aiming, but you get none of the drawbacks. The 5 pin setup is easy to use and creates a sight picture that is very easy to hit with. The sight is larger than others, simply because a larger bell is needed to accommodate the greater number of pins, but it isn’t as heavy as it’s competition. The price is well worth the benefits and features you get with this sight. If you would like to enjoy the benefits of a very intelligently designed sight, made by people who actually hunt, this is the best Trophy Ridge archery sight for your bow. This is a great single pin sight because it’s manufactured by the Austin Company Trophy Ridge and combines the simplicity of a single pin and the adjustability of a movable pin sight. It is a high-quality sight that uses tiny .019” exceptionally bright fiber optic for the sight picture. A single pin sight is favorable because it simplifies the aiming process. Looking through a single pin sight is like shooting an aperture sight on a rifle. A clean and crisp sight picture that is easy to hit with, however, they don’t do well at long range. Here’s trophy ridge’s answer, and excellent adjustable single pin that keeps the simple and rugged design common to single pins, but adds in long range capability. The greatest thing about this sight is the simplicity that brings all of the capability of multi-pin and adjustable sights. Under 50 yards and you can likely hold on the game itself, outside 50 yards just dial in the range with the huge adjustment range. Simplicity and ease of use, coupled with extreme accuracy and zero learning curve. The best thing about this sight is the single pin. It makes it a dream to shoot at long range, especially combined with the pinpoint accuracy of the adjustments for windage and elevation. If you want a do it all sight that you can use from point black, out to 100 yards, with a single pin, this is the only answer. There are three main types of bow sights today. Each one filled with a specific niche on getting your arrows on target accurately. See if you can get your hands on each type and shoot some arrows from each one to decide which one will be best for you in the upcoming seasons. Multi-pin sights are the most common. Most archers prefer these because you can set up each pin for a given distance and memorize what each pin corresponds to, theoretically giving you an aiming reference all the way out to the very edge of your bow’s maximum range. In the field, this works well if you are well seasoned and can remember which pin corresponds with which. However, for hunters with aging eyes or people who are prone to Buck fever multi-pin sights can lead to missed shots and wounded game. The simple fact is they are more complicated and harder to use than other types sights. Try and reduce the number of pins that you are using and try and never use the last pins on a multi-pin sight. Chances are, with a six or eight pin sight you are going to be using way too much range to target even the largest of game and your arrow is not going to have enough energy once it reaches the target. Multi-pin sights are going the way of the dinosaur and fewer and fewer hunters are using them each year. They aren’t as practical in the field as you would expect. Pendulum sights are a very specialized piece of equipment that you will only see intree stands. This type of sight uses a pivoting mechanism to compensate for the angle of the tree stand and the game underneath. This is a huge help because when using a multi-pin sight, or even a fixed pin sight, you can misjudge the distance between you and the deer, and shoot over its back. A pendulum sight swings out the word to compensate for the angle and provide a consistent aiming reference. These sights are great once you get used to them but are prone to breaking in the field because the mechanism isn’t as strong as a non-moving design. The other problem is that many pendulum sights are unreliable when a spot and stalk hunting or when shooting from aground blind. Make sure if you are going to be using a pendulum sight you only use it from a tree stand. Single pin fixed sights are coming back into fashion. The simplicity and ease of use that these sights offer cannot be overstated. With many common bows reaching faster and faster speeds a single pin may be utilized further out than on previous generation bows. Meaning that the entire effective range of your bow can be taken advantage of with just a single pin. These bow sights are especially useful for people hunting in close brush, or areas where they don’t expect long shots. For a new hunter who may be intimidated by a multi-pin sight or youth hunter who is going to be hunting from a tree stand or ground blind, that is close to a game trail or base station single pin sights offer a huge advantage in simplicity and ruggedness that no others offer. Movable sights are great for hunters who will be shooting at long-range. Anywhere from 200 yards can be dialed into a movable pin sight and hit easily. These are great for Western hunters who will be shooting game at extended ranges and for people who want to use their hunting set up forcompetition archery. Essentially you have a mechanism that adjusts the elevation of the sight that you can predict the arc of thearrowout to the very edge of the bow’s ballistic range. These sights are great once you get used to them but are more expensive, bulkier, and have a steep learning curve when it comes to using them in the field. Make sure you practice with your sight before you go into the woods, but no other sight offers as much adjustability and predictability than a movable pin sight. How does it feel to shoot at a target and to always be several inches off center? Needless to say, you will not feel very confident that you could be an effective hunter with a bow that cannot hit a stationary target. Do you know how to sight in a bow? If not, now is the time to learn how to do it. Maybe you have just purchased your first hunting bow. The smell of the freshly waxed bowstring intoxicates you as you pull the bow from its wrappings. Once you’ve completed any necessary assembly, you will need to attach the sight. You will want to be outside to perform some of these steps as you will need to fire the bow at a target. Loosen the screw that holds the horizontal adjustment mechanism for the sight head. The pins are usually slightly to the left of a nocked arrow, but you should start with everything lined up with both the string and the arrow itself. If you intend to use a peep sight, you may find it simpler to set the middle pin right in the center of the sight housing. With this setup, you can move the entire housing up or down to sight in the 20-yard pin. This setup features a problem for the archer who uses a high anchor point such as the earlobe. Because high anchor points will cause the sight pin range to decrease, your vertical adjustment point will be unable to drop low enough to accommodate the pins. If this happens, you will need to move the pins within the housing instead. Fire a few arrows to begin the sighting-in process. If you are hitting above the intended spot at your desired range, move the body of the sight upward. If you are hitting below, move the sight body lower. If you are hitting right or left, move the sight body right or left, respectively. To keep it simple, remember that you must “chase” the arrow with your pin to achieve the perfect shot. Once you have situated your 20-yard pin, move back 10 yards to sight in your 30-yard pin. Take the time you need to ensure that you are consistently hitting that 30-yard mark with the sight body adjustment. Once the 30-yard pin is set, you can use that position to adjust your 20-yard and 40-yard marks. If the 30-yard adjustment is done correctly, there is no need to move the sight body again. To give yourself the best possible opportunity for success when sighting in a bow, spread the project out over a few days. Your shooting form can shift from one day to another. As you work with your bow, you will eventually develop a standard form and can adjust your pins accordingly. Spreading the work out over a few days will also give you the chance to average your shots for the best possible results. After you have roughly sighted-in the front sight of a bow, you will need to attach your rear sight. The good combination includes a peep sight and a kisser button. A kisser button is a small disk attached to the string at the point where it will touch your lips or the corner of your mouth at full draw. A kisser button can also help improve low-light visibility and field of view. Some archers are able to use akisser buttonwithout a peep sight for excellent short-range shots. If your anchor point and shooting form are consistent, you may be able to get away with accurate shots no further than 30 yards. If you shoot beyond 30 yards, you may find your accuracy beginning to waver. Consistent accuracy with a bow requires you to be either extremely lucky or having a technique to help you hit the target. The peep sight can be greatly beneficial when properly used. A peep sight serves the same function as the rear sight on firearms and is used to consistently line up the front sight (in this case, the pin) with the target. When choosing a peep sight, you will need to choose which size is best. You will also need to consider the lighting conditions in which you intend to use your bow. The size peep you use will depend on how you want to use it. Some people like to place the pin in the center of the peep while others prefer to place the entire sight body in the peep. By using a round sight housing and the correctly sized peep, it is very easy to line them up for a repeatable shooting experience. You may also find yourself attempting to change your anchor point in your attempt to get the pin centered. If you still want to use the pin centering method, pick the peep sight that lets in the amount of light you think is necessary and is small enough to get the pin centered. The only trouble is that these requirements are in direct opposition to one another. To find that sweet middle ground, use a large round sight at least 1 5/8 inches in diameter. Next, decide the distance the peep sight will be from the riser of the bow. The further from the riser, the more calibrated the sight can be. After you have determined the distance from the riser, pick the peep sight that allows a small halo of light on either side of the sight body or around the colored ring of the sight. If you find that this is not possible, you will have to choose a smaller peep sight. If your peep sight is perfect upon installation, you are in luck! However, you will most likely need torevise the peepsomewhat before you can actually use it. Once you have properly aligned your sight, draw the bow to observe how small the peep hole is. Before you perform the next step,removethe peep sight from the string. You will greatly regret it if you attempt this next step with a peep installed on the string. Find a drill bit that is small enough to fit inside the peep while large enough to remove a tiny bit of the inside diameter. This step is much easier to perform with a drill press and a vise. Re-install the peep to check it again. If you have a set of drill bits in increments of 1/32 or 1/64, you are in good shape to get the ideal size for your peep sight. Some peep sights don’t allow you to drill the hole cleanly. Evaluate the peep sight you want to use before attempting the drilling. If you think you cannot safely drill the peep, find another brand. If you find that the peep is shiny after removing the excess metal, paint it with flat or satin paint. A permanent Sharpie marker will also do the trick. Before you go haywire over a rotating peep, shoot the bow a few times. Wait a few days before making any adjustments to allow the string to stretch and settle. When the peep appears to twist the same way every time you draw the bow, you can make your adjustments. To keep the peep from twisting when you draw your bow, place it in the exact center of the string. Bowstrings are made by twisting two bundles of fiber. You will need to separate these bundles to center the peep sight. The ideal bowstring is made with two different colors to allow you to easily identify the center. If the two strings are the same color, finding the center will be extremely difficult if not downright impossible. You will need to remove the string from the bow and attempt to determine the center by observing how the string behaves when it is not under tension. After you have installed the peep, take the bow out of the press. Place an arrow in the string and draw the bow to check the alignment of the peep sight at your most comfortable anchor point. Adjust as needed. If you are in the market for a new archery sight times have never been better. You have more options available to you than hunters have had ever before, and the competition is putting out excellent products for you to take advantage of. Make sure you scan through as many archery sight reviews that you can before you order equipment because the best sight out there might be something you hadn’t considered yet. Once you commit to a sight, get out and use it! The best bow sight in the world isn’t going to do you any good if it sits on your bow tucked away in a closet.